A persistent, mysterious "oil sheen" in the Gulf of Mexico near the site of BP’s Deepwater Horizon disaster grew to more than seven-miles long and one-mile wide during a recent stretch of calm seas, based on aerial observations made by a former NASA physicist turned environmental activist. "We had maybe three or four days (of calm weather) and that’s all it took for the stuff to build up considerably," Bonny Schumaker, the physicist who now runs the non-profit On Wings of Care, which makes regular flights over regions of the Gulf affected by the 2010 oil spill. In a flight report from Jan. 27 posted on the group’s website, she described the oily expanse as "huge." Schumaker first noticed the sheen in September 2012, when it was also reported by BP to the National Response Center, the point of contact for all oil spills and other discharges into the environment. Since then, BP has inspected the well site four times with underwater robots and found it secure. The company "also capped and plugged an abandoned piece of subsea equipment known as a cofferdam that was identified as a potential source of the sheen," reads a statement BP provided to NBC News via email on Wednesday. The cofferdam is the 40-foot-tall, 86-ton steel containment dome that was used in the early stages of the response in an attempt to trap the leaking oil and funnel it to the surface. "BP continues to work closely with the U.S. Coast Guard to investigate possible sources of a sheen in the vicinity of the (2010 spill site)," the company’s statement said. According to Schumaker, scientists who have sampled the sheen on several occasions "have consistently found the presence of alpha olefiens, which is a chemical bond signature of a man-made chemical you would not find in pure crude form." That suggests, she explained, that the source of the sheen is "residual material coming from the wreckage." If so, as far as impact is concerned, that is good news since it "would imply that it is finite in volume and temporary in time. There will be an end to it." Ian MacDonald is an oceanographer and oil spill expert at Florida State University. Another possibility, he explained to NBC News, is that the sheen is from a "natural seep that somehow became more active than it was before because prior to 2011 or so we had not seen abundant oil slicks at that location." 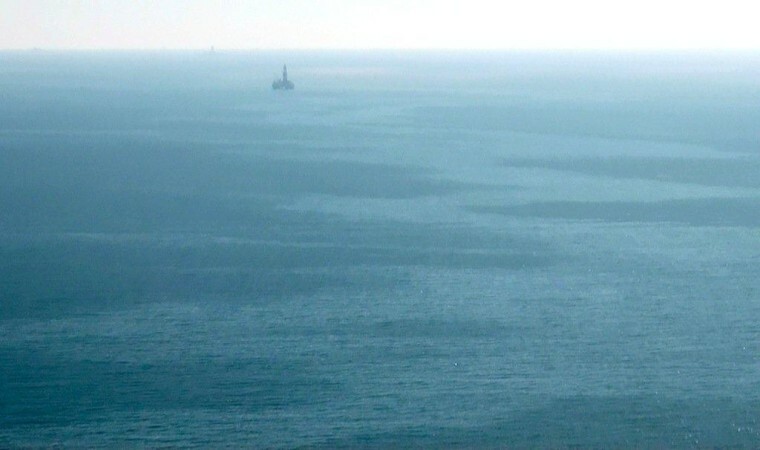 Images from Schumaker’s flights also indicate the presence of a new drilling platform in the vicinity of the Deepwater Horizon incident and these fresh oil sheens. "That doesn’t indicate culpability on anybody’s part — I want to emphasize that," MacDonald said. "But it does indicate that if you’re trying to do due diligence and monitoring a post-accident site of great interest the way the Deepwater Horizon site is, these are some of the things that you face." Whatever the source, the volume of oil coming to the surface is no cause for alarm, MacDonald noted. There are many natural seeps in the Gulf of Mexico that produce similar-sized persistent surface sheens. "It doesn’t rise to the level of being an imminent threat to wildlife or the marine ecosystem," he said. The concern, he noted, is trying to sort out its source. "The chemical data are a bit ambiguous." Some analyses he’s seen suggest the presence of drilling fluid, which is consistent with what Schumaker has heard. But other analyses, from other sources that he said he’s privy to, find no drilling fluid. In that case, it’s possible that the wreckage in 2010 somehow opened up a new fault on the seafloor. That possibility is inconsistent with BP’s findings, but would nevertheless indicate potential for an indefinite release of oil. Regardless of the source of the sheen, more disheartening to Schumaker is the "dearth of marine life" in a 30 to 50 mile radius of the site of the Deepwater Horizon disaster. She’s flies just about every month all year long. "Since the fall of 2011, now about 14 months, I see no turtles, few if any dolphins, few if any rays — Manta rays, cownose, golden rays, any of them — few sharks, few bait balls, all of the things we used to see," she said. That doesn’t mean the wildlife is dead, she noted, but what they eat may no longer be plentiful. As a result, they are going elsewhere to find food. A study published in August 2012 found that dispersants used during the spill response may have damaged the microoganisms at the bottom of the food chain, which would have dire implications for fish and larger sea animals. "I guess the Gulf of Mexico in these parts is a stinky, dead desert for its previous visitors," Schumaker said in an email to NBC News.